Today, Jan 15 2015 we approved the final master. It has been an all consuming experience since we first posted here, Sept 2013. We began this project with the intention of allowing ourselves time; time to find the optimum ways of recording our array of found sounds; time to build the perfect arrangements; time to allow the minutest of changes; time to be patient and uncompromising. All our changes during the process have made a world of difference. We embarked on this method to create a sound that we love and a sound that could not be achieved in any other way. Now we’ve reached the point of “letting go”. Next month the CD should be out in the world. The sound of struck glass cider jugs tuned with water will form the bass line of this new song. I’ve been using a bouncy ball impaled on the end of a knitting needle as a mallet, allowing me to literally bounce from note to note with the odd double/triple bounce for ornamentation. 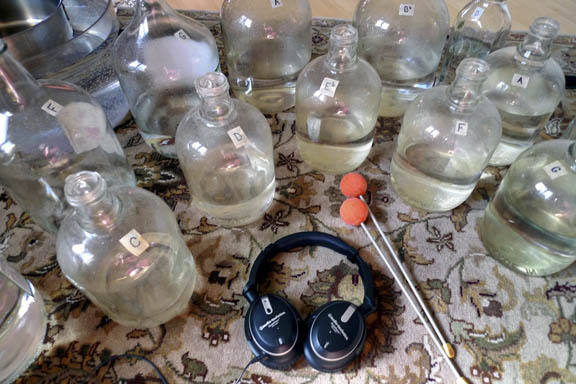 Someone asked “why go to all the trouble of collecting glass bottles, cleaning them, tuning them, training oneself to play them, when one could easily record just a single note into a computer and access this sound with a keyboard?” Well, the physical act of playing the jugs, of making the sounds, would be lost. And this would also affect the way I write the line. But essentially, much of the emotion one hears conveyed by music is derived from physically producing the sound.